Vilnius University Library is one of the oldest libraries in the Central European region. Founded back in 1570 by the Jesuits, the library was formed according to the principles of the Society’s educational system that was laid out in Ratio Studiorum (1599). 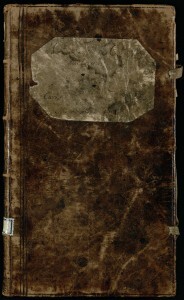 Private collections by the Bishop Suffragan of Vilnius Georgius Albinius (ca 1500/1510–1570), Tomasz Makowiecki (d. 1586), Piotr Oborski, the first rector of Vilnius Jesuit College Stanisław Warszewicki (ca 1530–1591), and the Bishop Walerian Protasewicz (ca 1504/1505–1579) made up the core of Vilnius Jesuit College’s library. Owing to Sigismund Augustus (1520–1572), King of Poland and Grand Duke of Lithuania, who bequeathed his personal library to Vilnius Jesuit College in 1579, the number of books in the library had greatly increased. In the second half of the 17th century, the Sapieha family made a donation of books to Vilnius Jesuit College, later entitled Bibliotheca Sapiehana. The donation consisted of 3,000 books from the private libraries of the Chancellor of the Grand Duchy of Lithuania Lew Sapieha (1557–1633) and three of his sons Jan Stanisław (1589–1635), Krzysztof Michał (1607–1631) and Kazimierz Leon (1609–1656). In the first half of the 18th century, the bishops Konstanty Kazimierz Brzostowski (1644–1722) and Maciej Józef Ancuta (ca 1650–1723) donated a part of their private libraries, although they could not equal to the previous donations in terms of value and significance. Just before the Suppression of the Jesuits in 1773, the library had around 11,000 documents. Due to various historical circumstances, at present Vilnius University Library has only a part of the old historical collection. In 2014–2015 Vilnius University Library has accomplished a research project Virtual reconstruction of the oldest academic library in Lithuania, financed by the Research Council of Lithuania (Contract No. LIT-8-78). The aim of the Project was to investigate the oldest extant manuscript catalogue of VU Library. During the course of the Project the 18th century catalog was transcribed and the publications recorded in the Catalog were identified within our capacity limits. The digital copy of the Catalog and all data were compiled in the database.